Got this amazing selection of books from a second-hand book-stall. What makes this is a pretty big deal is that the “second-hand stall” was held by the SPCA. I don’t know if I’ve ever mentioned it here but the SPCA put my dog down two years ago and it still upsets me. For years I supported the SPCA and it pissed me off when I took my dog to them and their version of help was to tell us to put her down. I was even more upset when I came across stories from people who said that the SPCA told them to put their dogs down. They took their dogs to their local vet and the dogs got better with time. So yeah I was incredibly hurt. 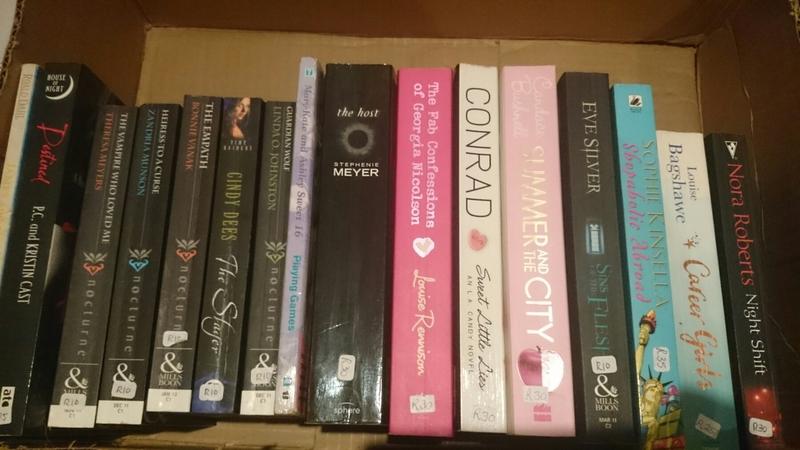 Going to the SPCA booksale hurt me because there was once a time when I was the one who donated stuff for the SPCA to sell. I pretended like I didn’t know where the proceeds from the book sale went. This worked really well for me as you can see in the picture above. However once we paid (the books were over R300) the lady selling the books thanked us for “supporting their cause”. I spent the afternoon and the night afterwards crying. I didn’t know who or how many pets my money would save but I did know that it certainly wouldn’t be enough. Someone somewhere would still lose a pet. And that hurt like hell. I’m hoping to make my visits to the SPCA booksale a regular thing. It’s a good way for me to get new books and maybe move past my SPCA issues.